Home » How to ? 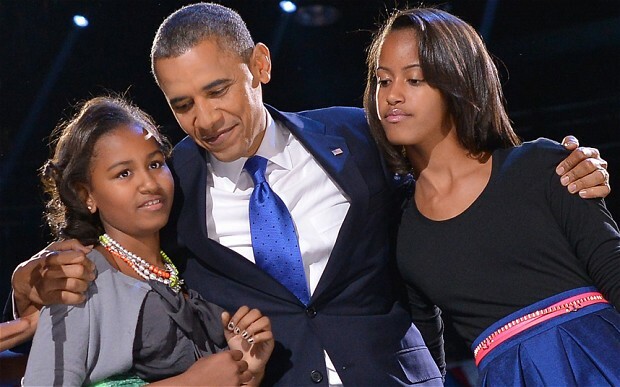 » How Obama Stopped His Daughters From Gettting Tattoos? How Obama Stopped His Daughters From Gettting Tattoos? obama daughters tattoos - President Obama has his fair share of parenting problems, and he even had to do something to stop his daughters Malia & Sasha from getting tattoos. So how did the President of the United States pull it off? Speaking on NBC’s “Today” show in a segment originally filmed before the Boston Marathon bombings, President Barack Obama revealed the strategy he and First Lady Michelle Obama have been using to keep their daughters away from tattoos. “What we’ve said to the girls is, ‘If you guys ever decide you’re going to get a tattoo, then mommy and me will get the exact same tattoo, in the same place, and we’ll go on YouTube and show it off as a family tattoo,'” Obama said. During the segment, the president also said he understood his wife’s “slip of the tongue” when she called herself a “single mother” in early April, noting that they were often apart for a week at a time when he was campaigning for the Senate and presidency. “I tend to cut my wife or anybody some slack when it comes to just slips of the tongue,” he said. “But there’s no doubt that there have been times where Michelle probably felt like a single mom … She definitely, I think, understands the burdens that women in particular tend to feel if they’re both responsible for child rearing and they’re responsible for working at the same time,” he added. One of the Oldest Vegas Casino Shuts Doors! More Head to Roll Over Secret Service Scandal ? Hillary Clinton to Run for 2016 President? How to handle Unruly child?